This is one of the rolls that I tried at Mobo Sushi. Even though I didn’t particularly like it when I ate the Flying Tiger at Mobo Sushi, it sounded like it should have been really good! So I decided to make it at home. I was right… this is a really really good roll!!! As I said in the Mobo Sushi post, I think I may have gotten a bad roll when I went to the restaurant. Mmmm yummy yummy… this is definitely something I would make again! (And again, and again) Perhaps I made it differently (I just used lemon juice… maybe they actually used slices of lemon?) or maybe I did just get a bad roll, but I definitely love it the way I made it! It’s very similar to the Crunchy Shrimp Roll, with the addition of imitation crab and the miso-lemon-mayonnaise. Once again, I’m so sorry for being away!! Almost 10 days since I last posted… gah. 20 units of classes doesn’t leave much time for sushi. 🙁 Plus I’m trying to make preparations for a birthday… whose birthday you ask? SushiDay’s!! We launched November 1st a year ago, so of course I have to do something to celebrate! 😛 (Yeah, we have posts before that, but they were filler posts because we couldn’t launch with an empty site now could we?!?) I wish I could hold a big sushi party and invite all of you, but 1. my apartment is way too small for that, and 2. I’m in school… so there’s no way I have time to get something like that together! Hehe. There will be a little something to celebrate though… it will be a surprise! Mix lemon juice, mayonnaise and miso well. 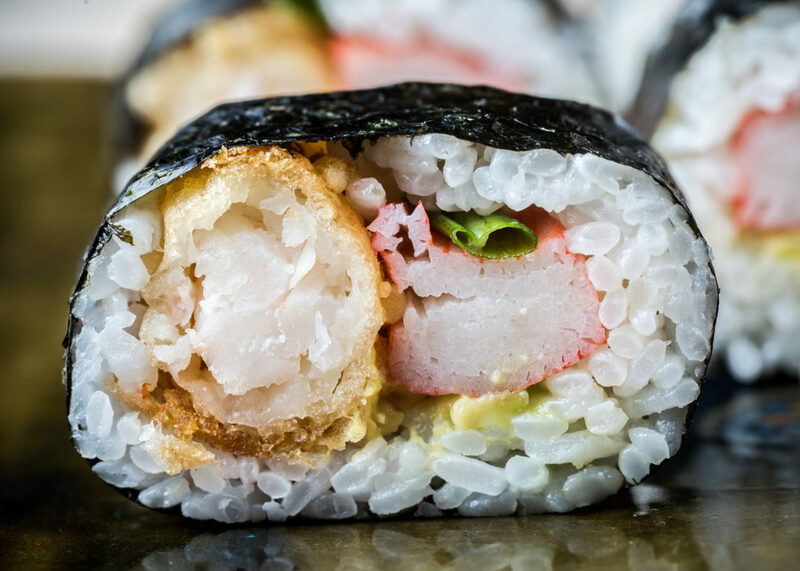 Roll the sushi, using 2 pieces tempura shrimp, avocado, one green onion stalk, imitation crab, and a line of the miso mayonnaise as your fillings. Yummm! Haha, I was thinking about an online sushi party because a lot of people seem to have those- “It’s a Sushi Party, and YOU’RE INVITED!” and I get all confused and then it turns out they’re just inviting me to make sushi and post about it on my site 🙁 Haha. I missed Feisty Foodie’s bday (October 1 officially, though I was working on it for a month before that…) Happy early bday to Sushi Day, can’t wait to see what you’ve got in store for us! And no worries on being too busy… it happens, right? Sounds like my kind of roll!! Mmmmm. Working on blocking them at the moment. When I succeed I will tell you how. Kind of rude isn’t it? Yvo – Happy belated birthday to Feisty Foodie! I hope I can get the stuff done on time… soo busy! Karianne – Hmmm… I looked at the site, and luckily it looks like the are just taking our rss feeds and presenting them as their own. I would be much more worried if they were taking our entire posts. Yeah it is screwed up that he’s trying to use our content as his own, but think of it more as any other rss aggregator, plus it still links to our sites, so I suppose it’s good for google ratings. 🙂 Plus it looks like it’s a relatively low traffic site, so I don’t think we really need to worry about it yet… I hope. 😛 Thanks so much for letting me know! I have dedicated a roll to you! Awww, thanks! That’s sweet of you. It looks like a really good roll!